Wheat is grown each year on more than 215 million hectares (ha) – an area equivalent to all of Greenland and spread across more regions than any other staple crop. Wheat is in high demand as a food for 2.5 billion people in 89 countries. Nearly US $50 billion-worth of wheat is traded globally each year. It is first among the three major staple crops as a source of protein in the diets of consumers in low- and middle-income countries, and second only to rice as a source of calories in those countries. In North Africa and West and Central Asia, wheat is the dominant staple crop and provides as much as half of all calories consumed. Over 60 percent of the world’s wheat is produced in developing and emerging countries like China and India. Global demand for wheat is expected to increase 60 percent by 2050, driven by urbanization, rising incomes and working women in low and middle-income countries. Wheat consumption is rising faster than its production, due partly to inadequate investment in wheat research and development. In eight of the last 15 years, world wheat production has fallen short of demand, reducing stocks dangerously. Extreme weather events have fueled volatility in commodity markets and destabilized wheat prices three times since 2000. Overall, the cost of wheat rose 115 percent during 2005-2011, particularly affecting poor consumers (including smallholder farm households), who spend much of their income on food. Models predict that if farmers continue to use current varieties and cropping practices, wheat yields in South Asia will fall as much as 30 percent by 2050 due to warmer, more erratic weather. Improved varieties and more effective cropping – rather than use of new land – led to remarkable wheat production increases that have fed expanding populations since the 1960s. The yield gains from those technologies have added at least US $500 million-worth of grain to wheat harvests each year and kept wheat grain prices at historically low levels up to 2005, benefiting farmers and poor consumers. 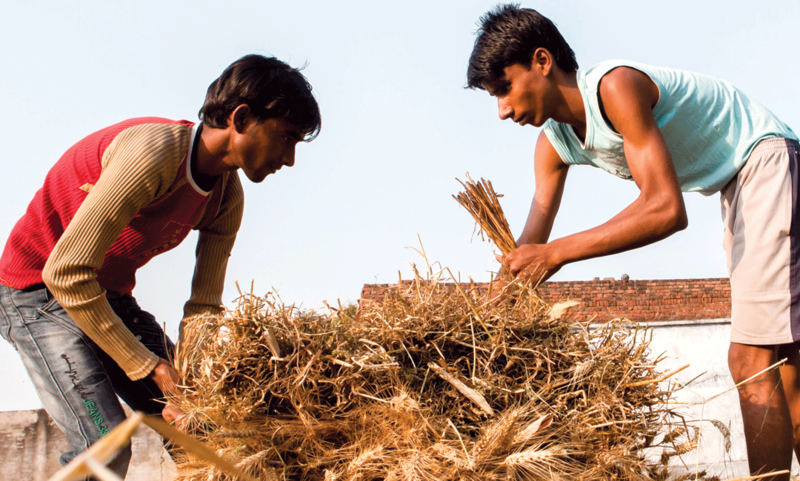 Appropriate technology and policies can once again power wheat-based farming to meet the crop’s accelerating global demand. This is WHEAT’s role. WHEAT delivers impact by fostering and strengthening partnerships. These encompass farmers and multiple institutions working across borders and at all levels, from policymakers’ circles and advanced laboratories to agricultural input and machinery providers. WHEAT also marshals and channels funding for greatest effect. Partners in WHEAT are breeding more productive, resilient wheat varieties and getting them to farmers in the form of high-quality seed. WHEAT researchers are honing and promoting more precise, resource-conserving cropping practices that save farmers money and reduce environmental impact. The work fosters equity for women and disadvantaged groups and better incomes and livelihoods. The challenges are daunting and agricultural innovations can take 10-15 years to develop and deploy, so this effort cannot stop – new research needs to start now and current work must intensify. Davis University of California, Davis, U.S.A.